At the Buell Theater, September 25 – 30, 2012. 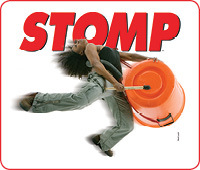 Opening night proved that STOMP is loved in Denver. It’s a fast paced show that literally starts with a toe tap and ends with uproarious finger snapping, foot stomping, tapping on cans, match boxes, brooms and hilarious and talented actors who hilariously interact with the audience a la mime. Adults and children alike, were compelled to interact with yelps and laughs as the actors pointed to the audience and engaged the crowd in this very creative and rhythmical beloved Broadway show. I rarely comment on currently running productions but will make an exception with “A Happy End” at the Buntport Theatre. Set in 1932 Berlin, it tells the story of a Jewish physicist and his family as they vacillate in face of the coming Nazi threat. Should they leave everything behind or might it all be a passing phase that will soon blow over? I was seven years old in Berlin in 1932 when I heard the very same discussions as many family friends decided to leave Germany. It became my quick lesson in survival and the end of being a child. My mother saw the coming danger whereas my father, who had been highly decorated for his service as an Army doctor during all four years of World War One, would not believe that his beloved Germany could allow Hitler to rule for any length of time. Iddo Netanyahu’s play brilliantly catches the conflicting emotions of the time, Ami Dayan’s direction is eerily reminiscent of Erwin Piscator’s 1920’s Epic Drama style and the cast is terrific. “Searching for Sugar Man,” is the movie to see this fall in art house theaters. It is a wonderful story about a little known ‘rock star’ who was hailed in the early 1970’s to be bigger than Dylan. Music producers predicted he’d be the next music star. As the albums were released, Rodriguez made no waves from Detroit, or any where in America for that matter, yet, during his 30 years of obscurity in America, he was completely revered in South Africa and quite literally was a bigger icon than Elvis. Rodriguez’s family had no idea of any of this until 1998, when two fans hunkered down to find out if any one in the world knew a thing about Sixto Rodriguez. The fabled story heard in South Africa was he had committed suicide on stage. For twenty five years his music was played and idolized, while the story of his death was the stuff of rock legends. Websites were created in South Africa, requesting any sliver of information about Rodriguez, who remained the mysterious, genius song writer from America. Then it happened one early dawn in 1998. The two South African fans, one a music store owner and one a music journalist uncovered astonishing facts. This story has caught the eyes and heart of every one who has heard the story or seen the newly released Music and Performing Arts Documentary, ‘Searching for Sugar Man,’released by Sony Pictures Classics. The movie/documentary was directed and written by Malik Bendjelloul. Its first screening was at The Sundance Film Festival. It left Utah with rave reviews. Enough said. You should see it or read about it. I refuse to say another thing. This is a movie that digs deep into the American soul. It resounds with every one who has ever lived and worked here. Rodriguez, like Woody Gutherie, is an American Hero. A legend and essential artist for lyrics that go beyond our every day struggles. Sixto Rodriguez’s words reached South Africa in a big way because he was talking about the struggles of people every where. His newly found, 34 year old, 2 1/2 albums have unleashed words that will last a lifetime, lyrics that come with a prolonged influence on the struggles of the working class every where in the world. Debut album, Cold Fact, is not sold anywhere in the USA. Cuts “I Wonder” and “Sugarman,” are as fresh and intelligent today as they were in 1968. Soon, I’m guessing, his song ‘I Wonder,’ will be heard on radio stations around Denver.